The College of Arts & Sciences is Baylor University's oldest and largest academic division. When classes began at Baylor in 1846, virtually all were in disciplines now contained within Arts & Sciences, and the College was formally organized in 1919. The College of Arts & Sciences now consists of 25 academic departments and seven academic centers and institutes. The more than 5,000 courses taught in the College (in more than 100 areas of study at the undergraduate level) provide the largest portion of Baylor's nationally recognized core curriculum, the foundation upon which every student's educational experience is built. Arts & Sciences faculty conduct important research around the world. In pursuing new knowledge, faculty members create a community of learning that encourages their students to join them in the discovery and application of that knowledge. Because many valuable learning opportunities can take place outside the classroom, Arts & Sciences students are also offered numerous chances to pursue hands-on internships, national and international scholarships and study abroad. The College of Arts & Sciences is under the experienced leadership of its dean, Dr. Lee C. Nordt, and eight associate deans. The College of Arts & Sciences had 5,972 undergraduate and 637 graduate students enrolled in fall 2017 -- almost 40 percent of Baylor's record total enrollment of 17,059. The Arts & Sciences student body is diverse, coming to Baylor from all 50 states, the District of Columbia and 64 countries and with an undergraduate minority enrollment of 42 percent. 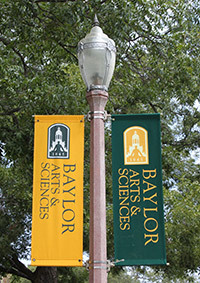 Most Baylor students must take courses offered by the College as part of their degree programs, and a large percentage of students go on to earn Arts & Sciences degrees. During the 2016-2017 Baylor academic year, 38 percent of undergraduate degrees and 20 percent of graduate degrees were from College of Arts & Sciences programs, representing 35 percent of all Baylor degrees. During 2016-2017, 84 percent of Ph.D. degrees awarded at Baylor were from programs in Arts & Sciences. Our faculty are affiliated with a number of special academic institutes and centers at Baylor, including seven institutes and centers within the College of Arts & Sciences itself. Several programs within the College of Arts & Sciences are among those nationally ranked in the 2018 edition of “America's Best Graduate Schools” by U.S.News & World Report, including the doctoral programs in clinical psychology and graduate programs in biological sciences, chemistry, earth sciences (geosciences), mathematics, physics, statistics, sociology, psychology, English and political science. Baylor has had 54 Fulbright Scholars since 2001, most of those coming from the College of Arts & Sciences. Students from Arts & Sciences have won other prestigious awards as well, including Truman, Goldwater, Gilman and Rotary Scholarships and National Science Foundation Graduate Fellowships. The Howard Hughes Medical Institute has chosen Baylor to join the Science Education Alliance, which engages Baylor students in scientific discovery on a national scale. Faculty in the College of Arts & Sciences have been awarded more than $5 million in grants and other funding to research and test new compounds and methods to both prevent and fight cancer. To help its students pay for their education, the College of Arts & Sciences has established 353 endowed scholarship funds with a book value of $28.3 million. University publications written and produced by Baylor Arts & Sciences students have a reputation for excellence, routinely winning top awards in national competitions. In 2016, the Associated Press Managing Editors of Texas named Baylor's student newspaper, the Lariat, as the best university and college daily newspaper in Texas. Baylor's Model United Nations, Model Organization of American States and Model Arab League teams, advised by faculty from the College of Arts & Sciences, have an outstanding record of giving students experience in public presentation, debate, research and networking. During the past 20 years team members have won numerous awards in state and national competition. Baylor debaters have been taking home honors since the University's first intercollegiate debate in 1893. Since that time, Baylor has won numerous conference debate titles as well as three NDT national championships. To better serve the Hispanic population in the United States, Baylor's Department of Modern Languages and Cultures has developed a course tailored to meet the crucial need for medical professionals to cross language and cultural barriers. The course blends medical terminology in Spanish with practical, everyday speaking and an emphasis on cultural differences. Professor Robert Darden from the College of Arts & Sciences is the founder of Baylor's Black Gospel Restoration Project, a national effort to identify, acquire, preserve and catalog historic music from the black gospel music tradition that is in danger of being lost. Project materials are among the highlights of a permanent exhibit called Musical Crossroads in the Smithsonian Institution's National Museum of African American History and Culture.